With a new venue found and a proper ranking to qualify for a title shot, all that Jamel Herring awaits is the blessing of the sanctioning body whose very belt will be at stake. The 2012 U.S. Olympic boxing team captain and decorated two-tour Iraqi war veteran with the U.S. Marines has cracked the Top 15 in the most recent edition of the World Boxing Organization super featherweight rankings. In being inserted at number 11, Herring is finally eligible to challenge for the 130-pound title currently held by Masayuki Ito. Once formally approved by the WBO, the bout will headline a May 25 Top Rank on ESPN telecast from Osceola Heritage Park in Kissimmee, Florida. The event will be part of an active weekend on site, as the location is an attractive hotspot for high school and college graduations during that time of year. The bout was once budgeted to air live from Camp Pendleton Marine Corps Base in Southern California, which would’ve marked the first time ever that a U.S. Marine will fight for a major title on a Marine base. The backdrop would have been a perfect fit, considering the show comes at the starting point of the Memorial Day holiday weekend. Logistical issues ultimately scrapped those plans, which remained risky anyway as WBO President Francisco ‘Paco’ Valcarcel was vocal in pointing out the fight hadn’t yet been approved by his organization. It remains the final remaining delay in the event being formally announced, although at this point would just be a matter of being approved by the WBO board. Herring's ranking came about after France's Jaber Zayani—inactive since last August—was dropped after being ranked number 10 spot as recent as this past February. With the fight moving to central Florida, Ito (25-1-1, 13KOs) returns to the very city where he first claimed his title. The streaking super featherweight titlist from Japan claimed a shockingly dominant points win over unbeaten Christopher Diaz last July at Kissimmee Civic Center, barely 10 minutes from where his second title defense will take place. Ito enters the fight on the heels of a 7th round knockout of Evgeny Chuprakov last New Year’s Eve weekend in his native Japan, with the bout having streamed live on ESPN+. As for Herring, keeping the May 25 date for his first title fight was key, and not just for his military background. It also represents what would have been the 10th birthday of his daughter Ari, who was just two months young when she passed away in July ’09 from SIDS (Sudden Infant Death Syndrome). Herring (19-2, 10KO) joined the Top Rank family last summer after spending the entirety of his pro career to that point under contract with adviser Al Haymon. The 33-year old southpaw from eastern Long Island has won three straight since signing with Hall of Fame promoter Bob Arum. The move also came with a corner change as he has spent the past year with trainer Brian ‘Bomac’ McIntyre, who is best known for his work with unbeaten three-division titlist and current pound-for-pound king Terence Crawford. Herring’s first fight with the team came last May at Madison Square Garden, scoring a 5th round knockout of veteran Juan Pablo Sanchez. A pair of lopsided decision victories have followed, having patiently waited for his shot at a title following an eight-round shutout of Brazil’s Adeilson dos Santos last December. Wedged in between came an equally dominant 10-round victory over John Vincent Moralde last September. 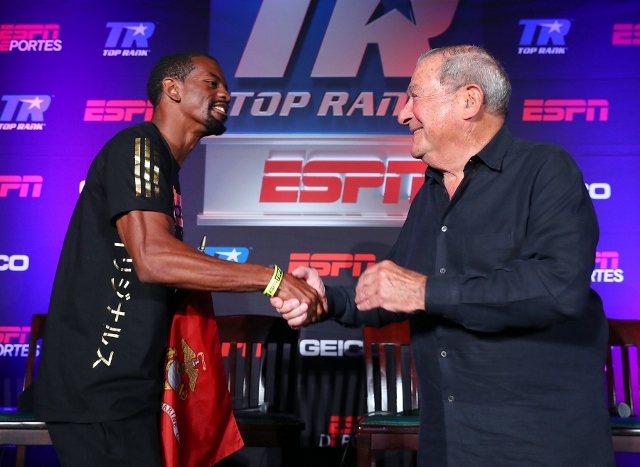 The bout served as the ESPN co-feature to his 2012 U.S. Olympic teammate Jose Ramirez’s 12-round title-defending win over Antonio Orozco, but the promotional buildup was hardly limited to the marquee attraction as Herring was granted a significant portion of the spotlight. Event handlers focused on his military background, which includes his having served two tours in Iraq during his time as a U.S. Marine. He spoke with local veterans, active Marines and future cadets during Fight Week, with his ring walk lined by 50 U.S. Marine Corps soldiers among the many more in attendance. It no longer remains the key storyline in his pre-Memorial Day title fight, but a line item he’ll gladly exchange for approval to even fight for the title at all. [QUOTE=Rbjr77;19607233]Could you be referred to as "troop"? [/QUOTE] I reckon one could say “troops” as a catch all sir. Could you be referred to as "troop"? Correction, US Marine Corps are Marines....not Soldiers. Soldiers are from the US Army. Never mistake one for the other. They don’t like being called Soldiers and we don’t like being called Marines.